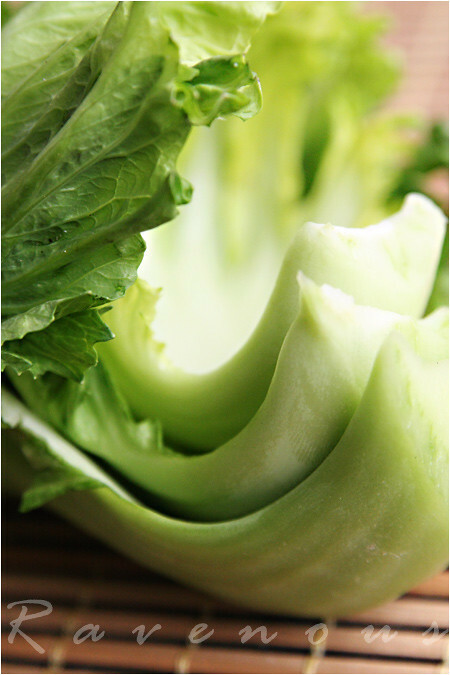 Mustard greens are great in stir fry’s and soups but a favorite way to this enjoy this vegetable is pickled. 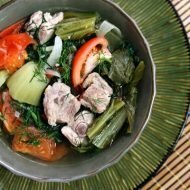 Growing up my mom always had a big jar of dua cai chua (pickled mustard greens) to serve during our weekday meals to complement any protein dish she made, whether it be ca kho to (clay pot fish), suon xao chua ngot (sweet sour pork ribs), thit kho (caramelized pork belly), or ga kho (caramelized chicken). The pickling decreases some of the bite of the bitterness and pungeness of the raw vegetable and brings out the natural sweet and sour of the mustard greens. 1. The most common is vinegar brine over raw vegetables. 2. Warm vinegar brine over blanched vegetables. 3. Seasoned brined (no vinegar) over vegetables. 4. Dry cure of salt and seasonings (no liquid) over vegetables. 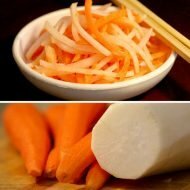 The classic do chua (pickled carrots and daikon) are of the first variety. But unlike do chua, our recipe for pickled mustard greens uses the third method, of a brining without vinegar. But pickling is like making nuoc mam, many people have their variations and you can make it as complicated or as simple as you like. Some like to even dry theirs in the sun before pickling. We just like to keep it simple and our method is so simple, we never buy pre-pickled packages or in the big bins in the Asian grocery stores.. Comparing to what you can make at home it’s so much cheaper and healthier…what’s all those extra ingredients!? The salt brine and natural bitterness of the mustard green ferments and in a few days you get tasty, crunchy dua chua. There’s no measurements in this recipe, it’s that simple. Cut off the end of the mustard greens and wash thoroughly. Chop into roughly 2-3 inch slices. Fill large pot of water-roughly enough to submerge the mustard greens in your container, and bring it to boil. Turn off heat and quickly blanch the mustard greens–no more than 10-15 seconds. Remove only the greens and add to your container along with the onions. Allow the water to cool a bit and season by slowly adding salt. You want it to taste like an overly salty soup. Add the liquid to the container and cover tight when cooled. Let it sit overnight on the counter overnight and refrigerate the following day. It should be ready in 24-36 hrs. Last for about 2 weeks in the fridge. Always keep handy and enjoy with any meat dish such as our sweet and sour pork ribs…the pickled mustard green is sour, sweet, and just enough bitterness and pungency to add any interest to whatever you’re making for dinner. Great idea! My mom has stopped buying the pre-packaged variety as she said it's too unhealthy. I should let her know how to make it from scratch! my parents would put them in the sun a couple hours before doing the pickling…hmmm i wonder why they that? My mom still pickles her own mustard, and I can tell you homemade is the best! Pickled mustard does taste great in soups with pork. I also remember having chopped pickled mustard in omelet, which was also very good. Totally agree. Pickled Mustard is great for stir fry. My fav. is to fry them with beef. very yummy. I've never tried to make pickled mustard before. 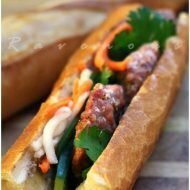 I think the homemade one is the best, tailor-made to suit personal taste. Wonderful ! noobcook: there's so many good uses for pickled mustard greens, thanks for mentioning them! KFP: it's really really easy. Lan: yes, drying them in the sun is pretty common practice..but blanching them serves the same purpose, to slightly wilt them and it's easier when there's no sun and you don't have to wait around for the sun. christine: oohh in an omelet sounds good! 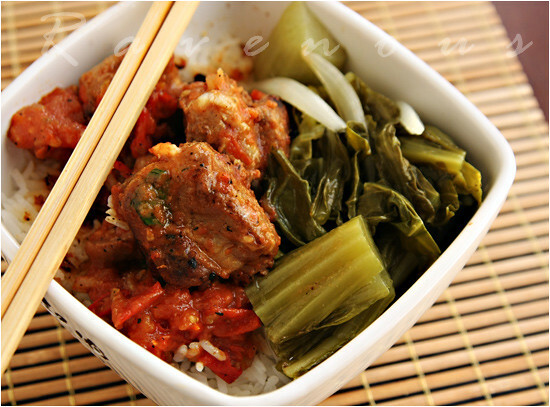 christine: stir fry mustard greens are indeed excellent! Pickled mustard greens sound wonderful, I can't wait to try to make them! Sounds terrific with the pork ribs! I've just discovered pickling with salt. Made some salt pickled sour plums. Have really enjoyed them. I'm going to try your mustard green recipe. Very cool. I've always seen the stuff in the store but I never buy it because I'm not sure who of the food source. Now that I have your recipe I don't have to ask my Mom for some! OMG i decided to be lazy the other day and used the packaged kind from thailand or somewhere and it ended up being a big mistake…tummy aches weren't the half… great job on the post! Ooh, I want to try this! I really like pickled vegetables but I've never made them before. I can mustard greens would be great this way with their slightly peppery flavor. jean and bao: let us know how it turns out! david: oohh sorry to hear that..the packaged items may be sitting on the shelf for a long time. I agree. Pickled mustards are the best when it comes to frying. I have been using it for like months now. My mom also blanched shallots halved/quartered for a nice kick. love making soup w/ pork belly slices fried in bacon scraps/drippings and a tomato. As a cihld my job would be to get a small dish and get some out to help set the table. 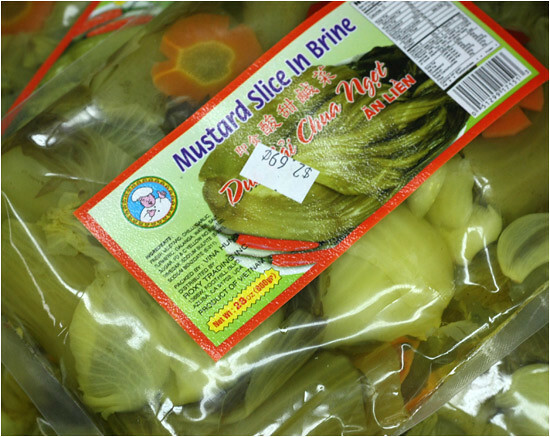 This or another vietnamese pickled goods (i.e. our kimchi) were a staple on the table. I’ve never cooked with sour/pickled mustard greens before. I don’t eat pork nor beef, anyone have chicken recipe I can try? Will it be sour without vinegar? yes! dry, then it pickles with just salt and water. Is being in the fridge necessary? I’m looking for a way to pickle some greens that don’t require refrigeration. Thanks! no, but it certainly last longer. if you choose not to refrigerate, then keep in cool dark spot.